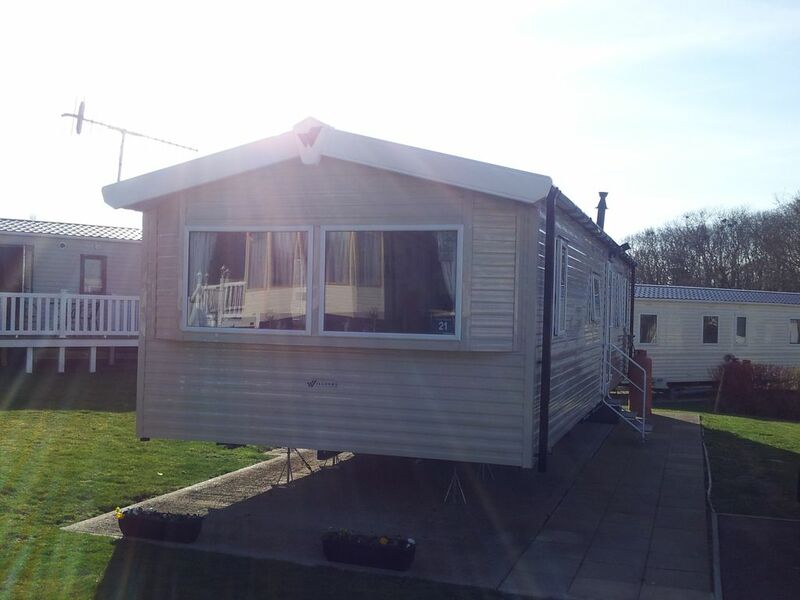 "Harvey's Hideaway " is a Superior grade caravan with the benefit of both double glazing and central heating with radiators in all rooms. We have now provided for your benefit a High Chair, , Potty ,Junior Toilet Seat and Travel Cot (will need to supply bedding) for our younger guests and to cut down on packing! The property has a separate cloakroom in addition to a family shower room. Towels are not provided and you will need to bring your own. The kitchen is equipped with a gas cooker, fridge with ice-box, microwave, toaster and kettle plus most other things you would expect to find in a kitchen. (Mugs, plates, bowls, cutlery, glasses, knife block, saucepans, cooking utensils, bottle opener etc...). The caravan has its own tarmac parking space adjacent for easy loading/unloading. This plot is located centrally on the site with all the amenities and activities only a short walk away, including shop, indoor pool, beach, evening entertainment, archery, play area and crazy golf. SITE PASSES are not included in the price, but can be easily purchased from reception when you collect the key. Prices start from £30 for a short break and includes everyone staying within the property. Washing facilities are available within the onsite laundrette. Clothes airer is provided and there are tumble dryer facilities available within the onsite laundrette. Site wide WiFi has been installed. We stayed over the May half term and had a great time. The caravan was very clean, modern and comfortable, although could do with a few baking trays and frying pans. The television signal was good and we all enjoyed playing some of the games there. It was only a few minutes from the pools and the Nab Bar. It was also only a 5 minute walk from the beach. The staff were very helpful. Helen was great and very quick to reply to any queries. We had some fantastic days out, all only a short drive away - Osbourne House, Bembridge Lifeboat Station, Robin Hill, Shanklin and the Needles. This was our first holiday with our dog and we found these tourist attractions to be very dog friendly. We ate in the White Mouse Inn after visiting the Needles, the food was good and we could take our dog inside. There was a good big garden with a play area for children. We managed to get most of the food we needed in the Coop in Bembridge otherwise I think you would need to travel to Shanklin or Ryde for a bigger supermarket. I am delighted to hear that you enjoyed your stay and that you had some fantastic days out! I look forward to hearing from you again if you decide to return in the future or should any of your family/friends wish to book. As a dog owner myself I have generally found many places to be dog friendly and I have been putting together a list of places i would recommend which accept dogs so any input is appreciated! Fantastic static, very clean, well equipped. Lovely area, close to the beach. Great for Kids. Thank you for your lovely feedback. I am really pleased that you all really enjoyed the trip and had a great time. I am really glad you enjoyed your stay and thank you for the positive feedback. Look forward to hearing from you again and hope you will come and stay again in the future.